Posted August 29, 2006 in Articles and Other Places. minutes, the small, almost perfectly circular lake was below us. 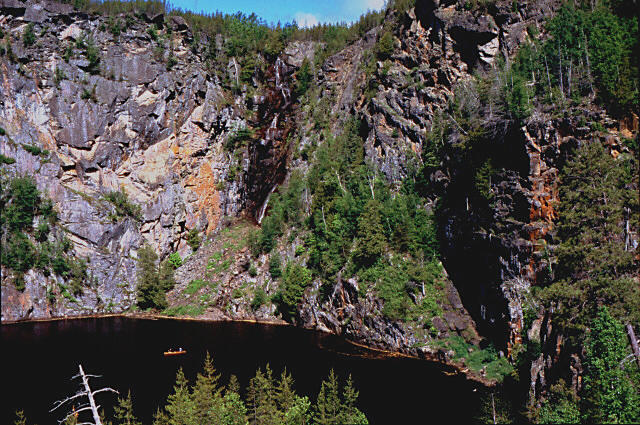 Surrounded by towering cliffs, it lay in the midst of a gently undulating topography filled with the bogs, creeks, small lakes and boreal forest that are typical of northwestern Ontario. In an otherwise relatively flat landscape, the crater’s presence, along with the kilometre-long canyon just southeast of it, was a mystery. I knew immediately that I had to see this remarkable formation up close. My son Leif, a graduate student at the University of Waterloo, and my good friend Al Maddox, a retired teacher and experienced canoeist, were eager to accompany me. 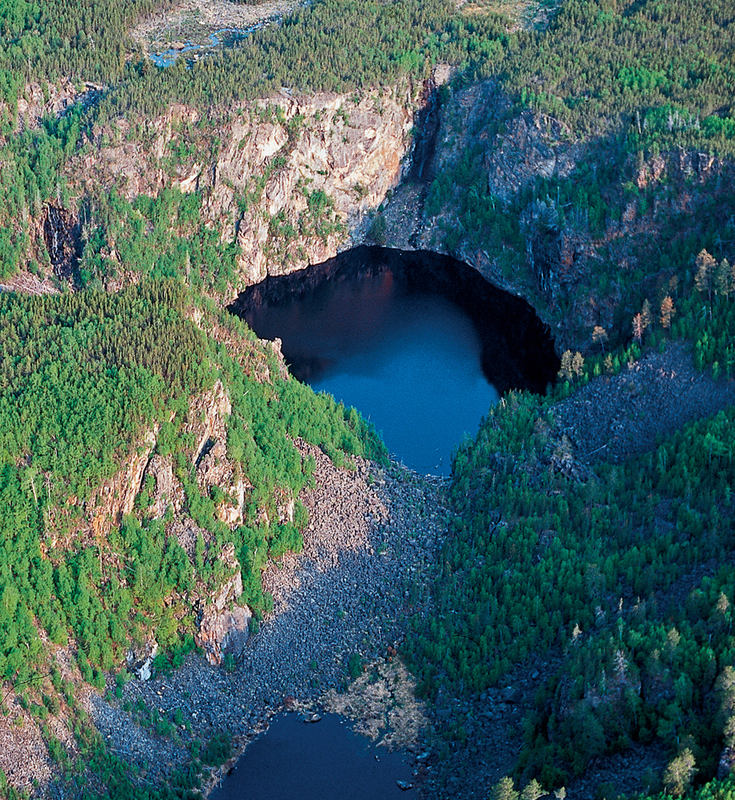 Devil’s Crater is located some 150 kilometres north of Thunder Bay, Ontario. There are no roads within 20kilometres of the crater and canyon, so we had Huron Air from Armstrong, Ontario fly us in. We landed on a small lake connected to the canyon via a narrow creek. In the last days of June, we found ourselves crowded into a single canoe, heading down the creek toward the crater. Before long, however, a combination of shallow water and boulders made further progress impossible. 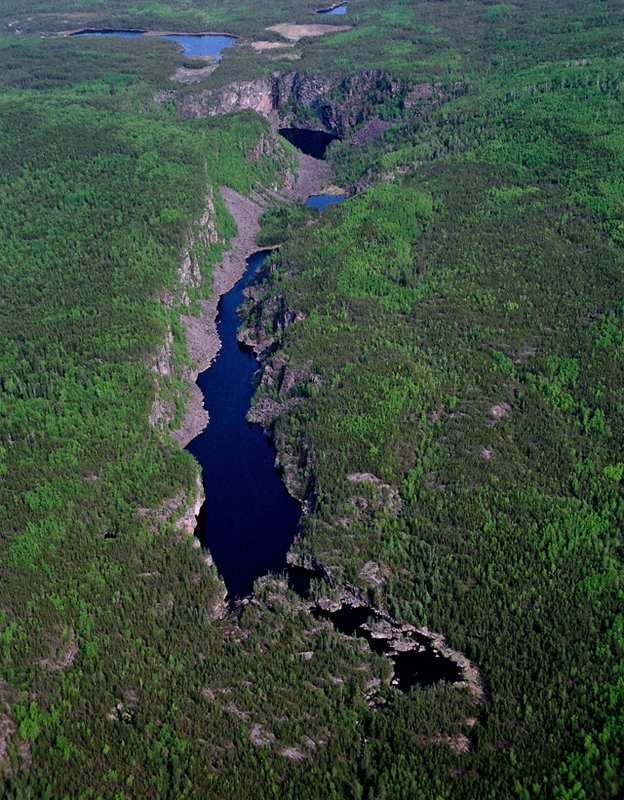 Despite much searching, we could not find a portage, although we knew that two other groups from Thunder Bay had reached the crater by this route during the last few years. In 1997, Bill Ostrum, the owner-operator of a Thunder Bay company that designs and makes packs, had paddled to the small lake we had landed on and attempted to walk to the crater along the side of the canyon.Travel was very difficult, because a forest fire in the 1980’s resulted in dense growth of jack pine and a lot of blowdown, and he turned back. 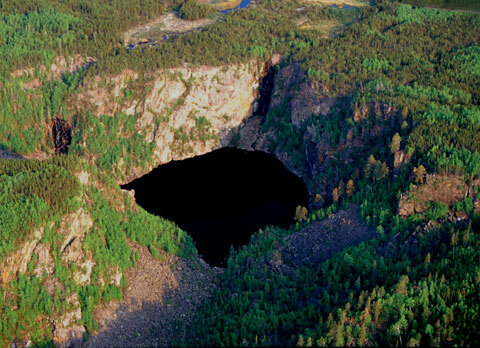 Julian Holenstein, an Environmental Consultant for the city of Thunder Bay, Ontario, was told about the crater by Bill Ostrum and the following summer, he led a group of four people to the crater. The next summer, Bill and Anne Ostrum also reached the crater. These two groups, and undoubtedly others, had reached Devil’s Crater by the same general route that we were now using.We couldn’t, however, find any evidence of the portage that they used to bypass the unpaddleable section of the creek so we quickly put in a “minimalist” portage that was roughly parallel to the creek and avoided wet areas and large rocks. If this route gets used very much the portage will undoubtedly be rerouted somewhat but it served well for our purposes. In addition to the summer excursions, Volker Kromm, a forester with Abitibi Consolidated, and two companions made a trip by snowshoes into the crater in the winter of 2003-2004 to do some ice climbing. They successfully climbed both waterfalls that enter into the crater and took core samples of red pine, growing near their northern limit, that grow along the edge of the crater. In addition, Native People have undoubtedly visited Devil’s Crater numerous times over thousands of years. Although the canyon and crater wouldn’t have had much appeal for hunting or fishing, a site this unusual has an appeal that goes beyond just obtaining resources.The crater is also part of a trapline for a member of the Gull Bay First Nation on Lake Nipigon and First Nations communities in the area have a long history of visiting the crater. The view as we paddled up the canyon towards the crater. We had a beautiful paddle up the canyon. The day was cool and sunny, and there was enough wind to keep the bugs to a minimum. Along the canyon shoreline were large rocks and scree slopes at the base of the cliffs. In other spots, the majestic cliffs soared directly out of the dark waters, in which we could see the shimmering reflections of our surroundings. A study of the vegetation in the nearby Ottertooth Conservation Reserve was conducted by Al Harris and Robert Foster. They found that the large forest fire in 1980 resulted in a landscape dominated by young jack pine mixed with trembling aspen and white birch. There are also isolated small stands of red and white pine, both of which are near the northern edge of their range.Some old stands of black spruce and cedar are found in the swamps. On the west-facing cliffs along some of the lakes they found three arctic alpine plants, Nahanni oak fern, smooth woodsia and showy locoweed, that are rare plant species in Ontario. North facing cliffs at Ottertooth Canyon support an exceptionally rich community of arctic alpine plants including Snowy Arnica, Appalachian Firmoss, Northern Woodsia and Northern Goldenrod. Although no botanical surveys have yet been completed at Devil’s Crater, its similar cliffs probably also provide habitat for some interesting species. We were eager to fish as we had heard that brook trout might be present. We fished for a short time as we paddled up the canyon and managed to catch a northern pike but no trout. I found that, as gorgeous as the canyon was, it was difficult not to keep looking ahead trying to catch a glimpse of our destination: Devil’s Crater. The only obstacles we encountered while paddling up the canyon towards the crater were a two-metre high rock wall that we had to portage over near the beginning of the canyon and a short section near the end of the canyon closest to the crater where it became too shallow to paddle the canoe.We then paddled across a large pool which marks the end of the canyon. We were hoping to portage along the base of the scree and reach the crater with relative ease. As the designated photographer, I went ahead and climbed partway up the side of the crater. Leif and Al had the much harder task of hauling the canoe over a great jumble of boulders while weaving it through trees and shrubs – so much for the “relative ease” plan. From my perch I could see two small waterfalls cascading down the cliffs that formed the far wall of the crater – the only visible sources of water entering Devil’s Crater. Leif and Al in our canoe inside Devil's Crater. Despite what the lake’s name would suggest, a meteorite did not create Devil’s Crater. 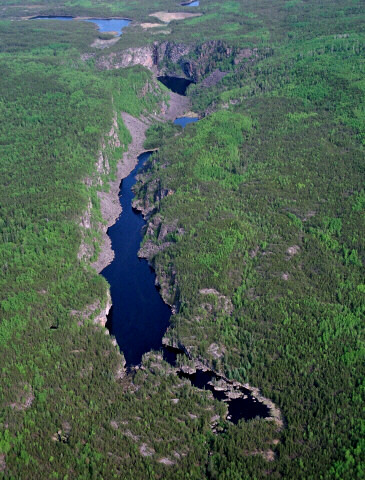 The impressive force responsible for the crater’s creation, and the canyon stretching out below it, was the combination of the retreat of the Laurentide Ice Sheet and the overflow of glacial meltwater from Lake Agassiz, which was then located just west of the crater. The flow from the two small waterfalls that now enter the canyon is a mere fraction of the torrent that carved this feature into the landscape over 9,000 years ago. Thousands of years of erosion have also softened the crater and canyon. Falling rock combined with lichen growth make it difficult to determine just how much water must have surged through the kilometer-long canyon when Lake Agassiz overflowed. The events that produced Devil’s Crater not only altered the landscape significantly, but may well have been the catalyst for climate change and influenced the migratory patterns of the first humans who lived in this area. Approximately 18,000 years ago, the air temperatures of the earth began to rise as the planet emerged from the most recent Ice Age. Massive continental glaciers, including the Laurentide Ice Sheet that had blanketed most of central North America were slowly retreating. The water pouring out from the melting Laurentide Ice Sheet – which covered much of what is now Ontario, Manitoba and parts of Quebec, Saskatchewan, Nunavut, Minnesota and North Dakota – produced enormous lakes. One such lake was Lake Agassiz, which was formed to the south of the retreating glacier. Lake Agassiz extended over more than 1.5 million square kilometers, an area larger than all the present Great Lakes combined. As the lake slowly shifted northward following the retreat of the massive glacier, its shape, size and position changed significantly. Over a 5,000 year period, various outlets routed the lake water in three different directions: south through what is now the Mississippi River Valley to the Gulf of Mexico, east through the Great Lakes and what is now the St. Lawrence River to the Atlantic Ocean, and finally north to Hudson Bay and the Arctic Ocean. Changes in the direction of the outflow of Lake Agassiz would have significant consequences. It has been generally accepted that the eastern overflow of Lake Agassiz initiated some 11,000 years ago resulted in a tremendous amount of glacial melt-water surging through the Great Lakes basins into the North Atlantic Ocean. The influx of fresh water essentially diverted ocean currents in the North Atlantic, resulting in a significant cooling of the climate in North America and Europe.This 1000-year cooling period, referred to as the Younger Dryas, is characterized by the lowering of average air temperatures around the North Atlantic at a time when global temperatures were increasing. As Lake Agassiz continued its northward shift, the land behind it slowly rebounded as the great weight of the glacier withdrew. Water from Lake Agassiz flowed south when ice occupied the Superior Basin. Then it flowed again to the east, this time through Lake Nipigon and on to Lake Superior and the North Atlantic Ocean. Large volumes of water flowed through channels that today are shallow streams and creeks. As the glacier receded, new outlets formed in a northerly pattern. 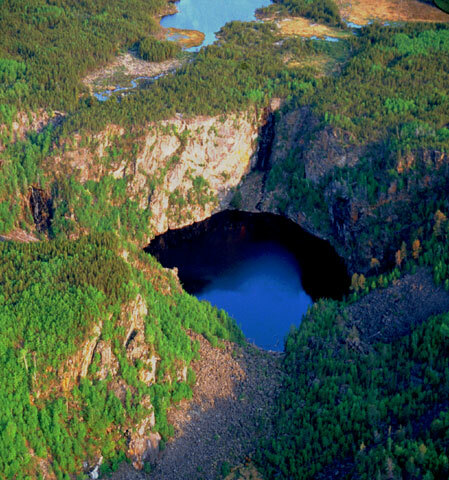 The water ran through this new area with such tremendous force that it carved Devil’s Crater, along with the canyon southeast of it, out of the bedrock of the Canadian Shield. In creating this deep gash in the landscape, the rushing water worked in tandem with local geology. The crater and the canyon probably began as a fault in the bedrock. The immense overflow eroded the bedrock along the fault to create the crater and the canyon. Eventually, the continued retreat of the glacier and the rebounding land surface behind it opened up new outlets north of Devil’s Crater. The outflow through Devil’s Crater would have lasted only a short time, anywhere from a few years to a couple of hundred years. James Teller, professor of geology at the University of Manitoba and a leading researcher on Lake Agassiz overflows, describes the crater as “a paleoplunge basin, formed by Lake Agassiz overflow that eroded the less resistant diabase on the down-flow side of the fault contact with the resistant granite”. Devil’s Crater is a dramatic example of what moving water can accomplish in a relatively short period of time. From inside the crater, the view is incredible. Two-thirds of the crater’s edge is a curved wall of dramatic, lichen-encrusted cliffs that rise more than 70 meters directly out of the water. 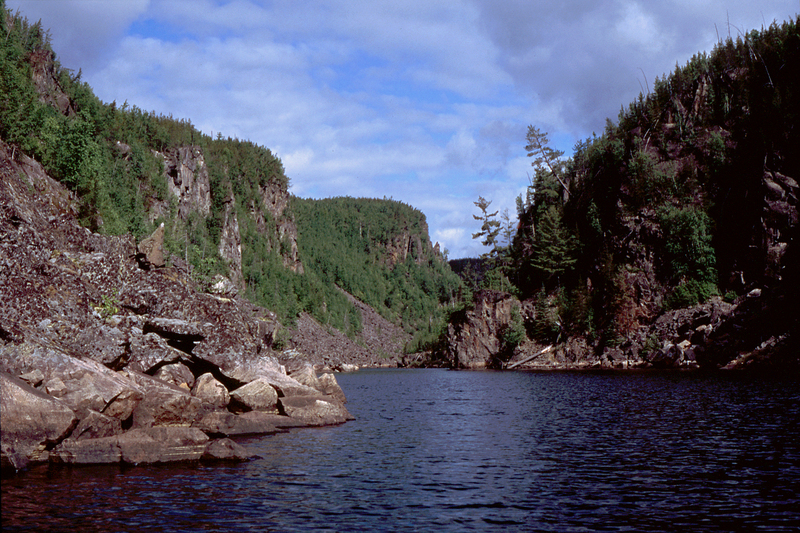 When seen from a canoe on the lake, the cliff walls seem even higher because the lake is only about 200 metres in diameter. The remaining portion of the crater’s edge is a steep slope composed primarily of large boulders. Al noted that, from some locations, there didn’t seem to be any way out other than scaling the cliffs. Near the middle of the lake, we tied a rock on the end of a rope and lowered it to the bottom in an attempt to estimate the depth of the water. We were astounded to find that our primitive measuring device indicated that this tiny lake is approximately 70 metres deep. Devil's Crater is a reminder of the power of water and its ability to alter the landscape. When traveling into and out of the crater, we were paddling near the bottom of a spillway formed more than 9,000 years ago. What is now a canyon was once filled with water that moved with enough force to enlarge a crack in the bedrock and form a chasm. The area we traversed on our way into the crater, which is now a mass of car-sized boulders, was once submerged beneath at least 50 metres of rushing water. Today, large white and red pine trees grow along the canyon and near the edge of Devil’s Crater. Researchers, primarily Dr. James Teller and associates at the University of Manitoba have found that the terrific amount of water that once tore through this area left behind remnants of riverbeds, broad, flat deposits of sand and gravel, and giant boulders at various locations between Lake Agassiz and Lake Nipigon. In recognition of the significance of these area, the Pantagruel Creek Provincial Nature Reserve and the Ottertooth Conservation Reserve where created. Ottertooth Canyon, Devil’s Crater and Mink Bridge Portage Falls on the Kopka River were all created by glacial melt water surging out of Lake Agassiz towards the Lake Nipigon basin and on towards the Atlantic Ocean.Bill Ostrom has noted that probably nowhere else in Ontario are there three such spectacular landforms so close together. Lichens, herbs, grasses and shrubs quickly populated the newly exposed land. Large, cold-adapted grazing animals such as woolly mammoths, muskox and barren-ground caribou thrived. So did sabretoothed tigers and “dire” wolves, which grew to one and a half times the size of timber wolves. The most intimidating predator of all, human beings, may also have been present. Palaeoindians, the first people known to have inhabited this region, probably followed the large mammals in their northerly migration. Floating in our canoe on the small, placid lake inside the crater, we were in awe of what occurred here at the end of the last Ice Age. The crater’s two small waterfalls are reminders that just over 9,000 years ago, an outpouring of water draining a lake that stretched all the way to Saskatchewan careened and swirled through here with devastating power to form Devil’s Crater and the canyon below it. These formations are portals to the past. They remind us how, in an instant of geological time, a piece of Ontario’s terrain was dramatically altered. This article was written by Jon Nelson and Leif Nelson. Leif Nelson was a graduate student in the Earth Sciences Department at the University of Waterloo when this article was written. He now works for the Ontario Ministry of the Environment. Hi I was inspired reading about this place and a couple questions came to mind. Whats the fishing like, is there any place big enough to pitch a tent as in a 6 man and how was the hike? would you recomend this place on a scale from 1 to 10 please lemme no and thanks for posting the articles I had a good time reading and learning about this portal to the past.